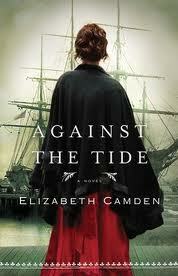 Elizabeth Camden’s latest book, Against the Tide is billed as Historical Fiction. As a sub-genre it is a romantic suspense as well and a hard book to put down once you start reading it. Lydia Pallas is an unlikely heroine. Orphaned at age nine with very little understanding of English she grows up in an orphanage but is quick to learn languages. Once out on her own she craves stability and security and finds a position translating for the Navy. While serving in this position and in desperate need of money to save the only home she’s ever felt was her safe place to be, she meets the enigmatic Alexander “Bane” Banebridge who hires her for translation work that seems like foolishness. Desperate for the money, she engages in the work but along the way falls in love with the man. Bane is on a mission to rid the world of opium. Having been held captive and eventually apprenticed to a master shipper of this substance he is now free on a new path of redemption after meeting Jesus. He needs Lydia’s help but can he survive the emotional connection he feels for her? Can he win his war without losing the woman he loves on the way? Lydia has her own battles to face that could ruin any chance of a relationship with Bane but she steps out of her comfort zone to take on a risky task to not only save someone else but hopefully a future with the man she loves. Will she survive her many challenges and will Bane still be there to love her when it’s all over? Will she understand the grace that God gives to those who seek Him? This book was hard to put down and a riveting read to see the prevalence of opium being fed to the general population in the late 1800’s in the United States. Reformation of this wrong was slow and painstaking and fought by people with great courage. This book is a worthy read and far more exciting than the front cover would indicate. Again nice review. This is the first book I read (finished) of hers and it was sooooo hard to put down!! Definately a winner on so many levels.